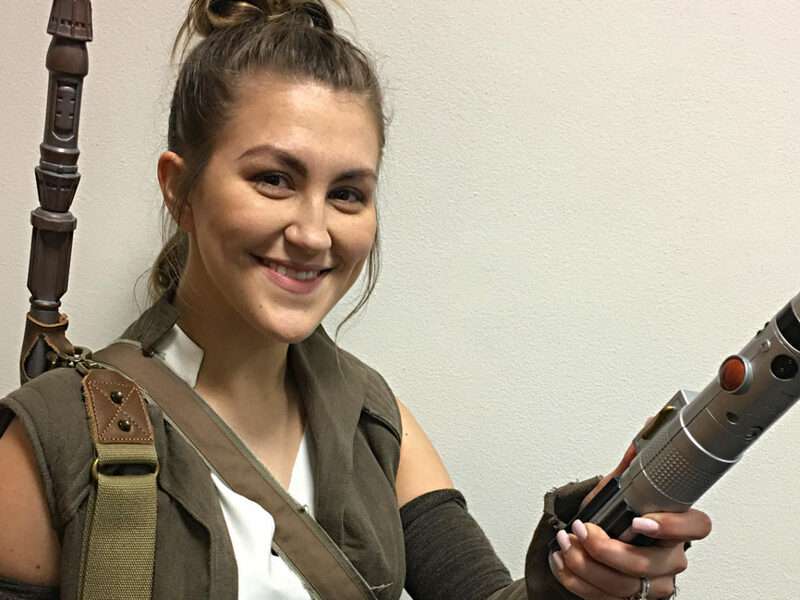 Just in time for Celebration Anaheim, learn how to dress like the Ghost crew's stylish explosives expert! 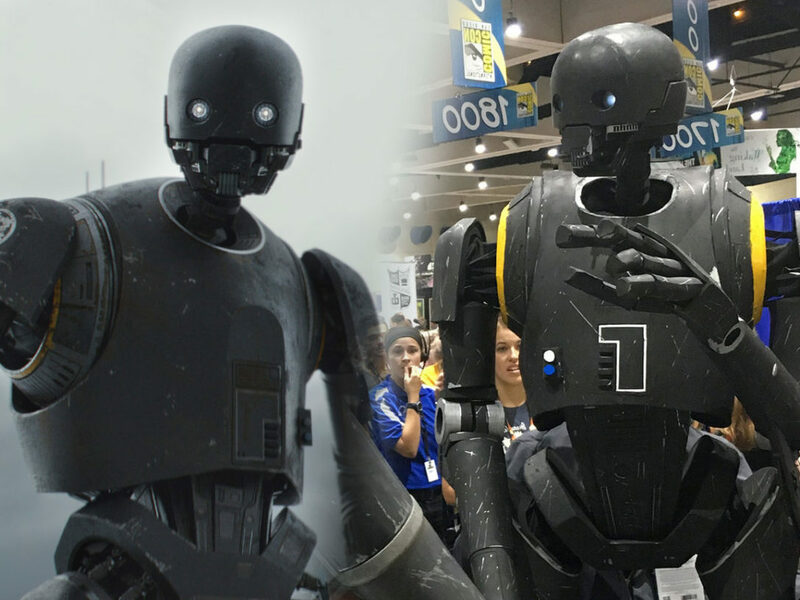 I love, love, LOVE (yes, all caps love) the character design for Sabine from Star Wars Rebels. The colors are fantastic, and the design lines are perfection. I would dress up as her every day if it were even remotely practical, but I suspect all that armor might get me in trouble on my usual train commute. 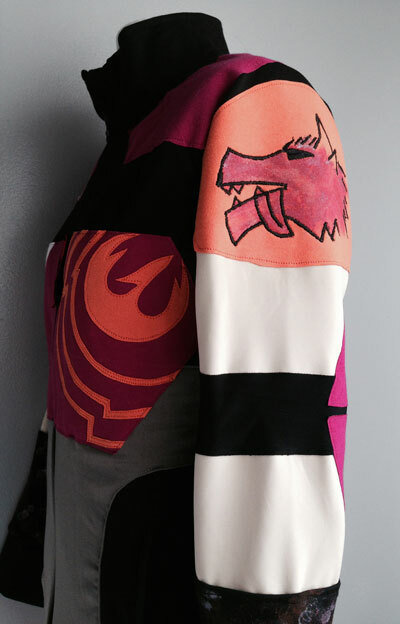 So I decided to make a jacket inspired by Sabine’s look, but all fabric. 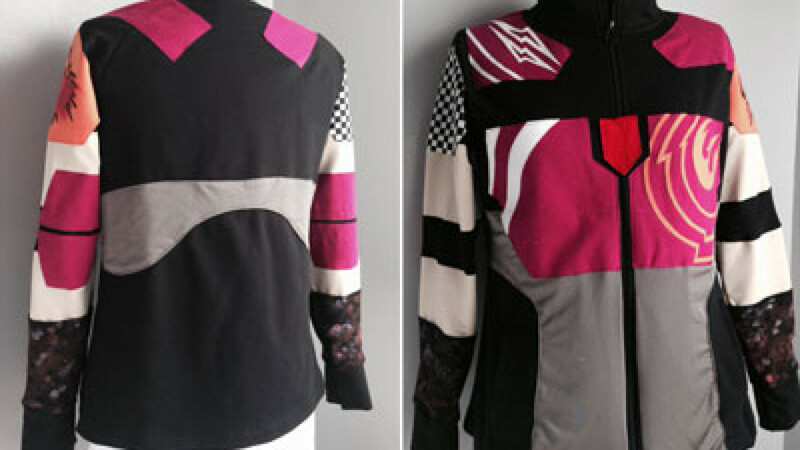 I started with an inexpensive athletic jacket that I found on clearance at a discount store. Then I used my trusty seam ripper to pick open the side seams. 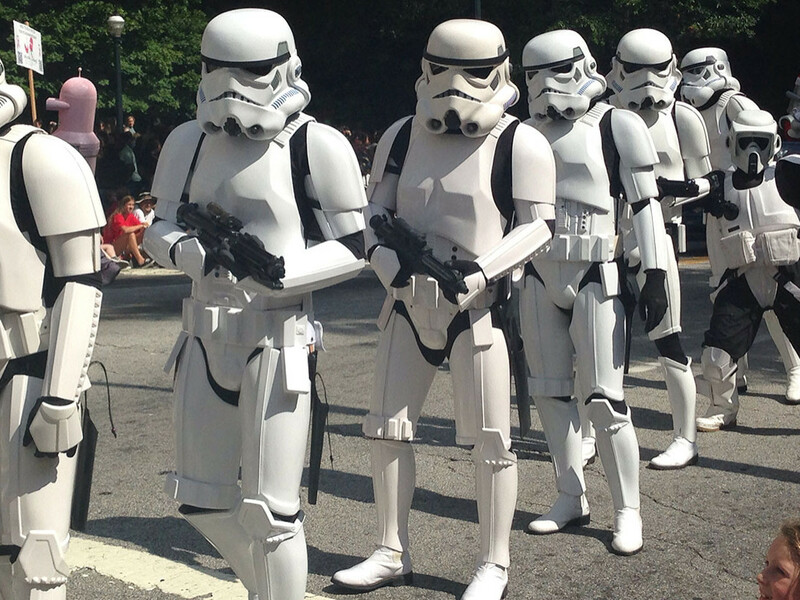 (This takes a while — perfect time for a Star Wars movie.) You may want to buy a size up from your normal size jacket; as you attach all the details and reassemble your garment, it may end up a little smaller than the one you started with. I started with a ladies’ size L and the finished result is indeed a bit smaller than that. 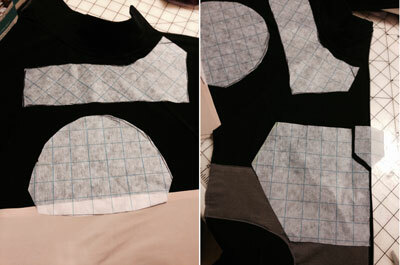 Once I had the side seams opened up, I drew out the basic shapes for the lighter gray panels of Sabine’s top. The key in this step is to make sure the placement of the gray pieces lines up on the front and back. That way, when you stitch the side seams closed again, the front and back have continuous lines of color and it will look nice and polished. Once I had my shapes laid out in paper, I cut them in fabric (I used a silvery spandex remnant), adding a quarter inch around the edges as seam allowance. To apply each front piece, I first stitched it to the jacket front, wrong side down and close to the line of the jacket zipper as shown below. Then I folded the gray fabric back along my stitch line so the right side faced up. Next I top-stitched along the top edge, the curved side edge, and the bottom with the fabric folded under. If your jacket has front pockets like mine, you may have to do some very careful stitching of the front piece if you don’t want to accidentally close up a pocket on the inside of the garment. 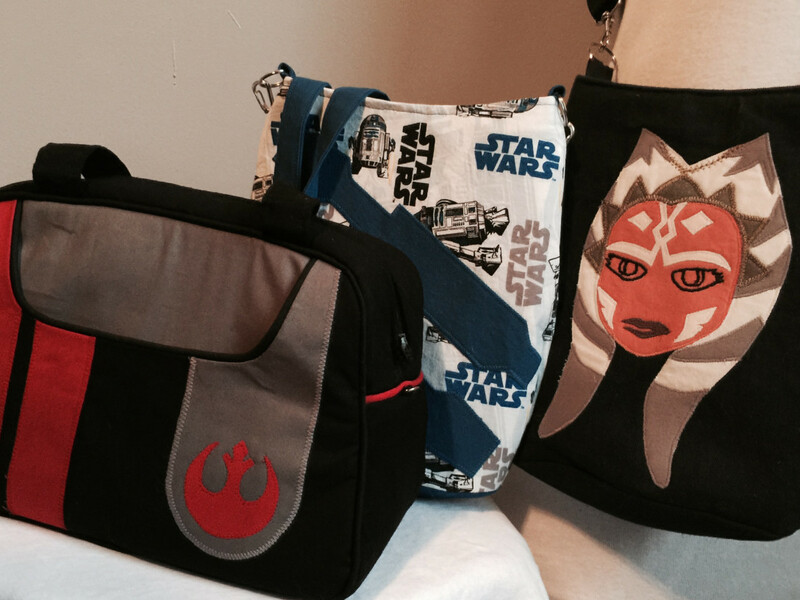 Pin everything carefully first, and remember that you can always hand stitch a bit if you need it. Here’s a tip for sewing those folded and curved edges: Before you attach them to the black base jacket, straight stitch a quarter inch from the edge of the fabric, being careful not to stretch it out of shape. 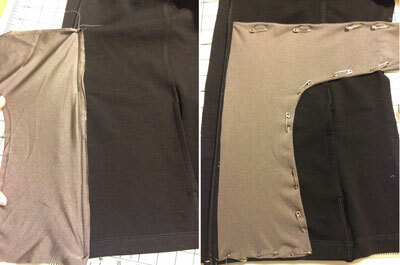 For curves, clip along the seam allowance that will be turned under. 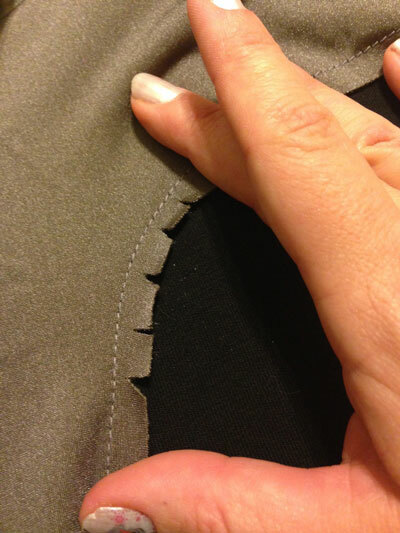 This makes the fabric able to fold under and sit nice and flat — if you skip the clipping step, your fabric will pull. 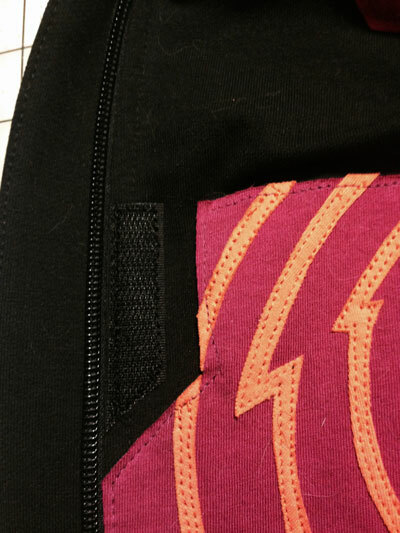 The stitching makes and easy folding line for tucking your raw edges under. I attached the back silver piece by folding under the top and bottom edges, clipping as needed, and top stitching them into place. 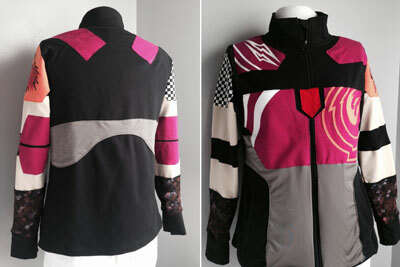 Sabine’s jacket is short-sleeved, but I wanted full sleeve. So to mimic the exposed part of her arm, I used a skin-tone spandex (match it to your skin tone!) and applied it to each sleeve in much the same way as I attached the silver front pieces. To find my upper placement point, I just draped the sleeve over my arm and eyeballed where I felt like it should sit. I stitched the upper line of the fabric with the skin-tone piece face down, then folded it downward and stitched the lower edge into place. 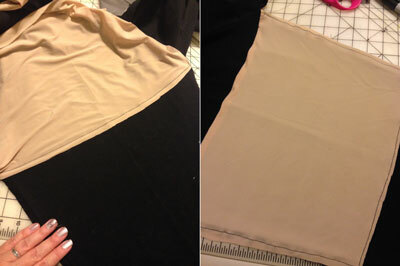 (No need to fold in the raw edge on the lower edge of your skin-tone fabric – it’ll get covered up in a later step.) The length of this piece will vary from person to person, but for reference, I cut mine about 10 inches tall and the width of the widest part of the sleeve. You’ll want to carefully mark the points where the top edge of the sleeve will be on each side of the sleeve so it looks like one continuous block of color when you stitch the sleeve closed. Once the lower edge was stitched in place, I used a long stitch to baste the spandex to the jacket fabric along each side of the sleeve, and then trimmed away the excess of my skin-tone spandex. Next I added black armbands over my faux bare arm sections. 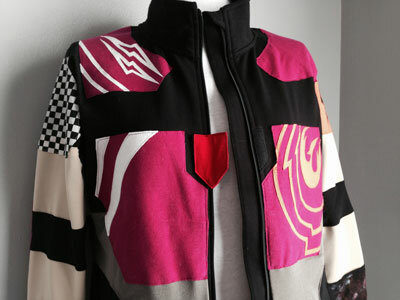 Just as with the skin-tone panels, I draped the jacket sleeve over my arm to get the placement right. 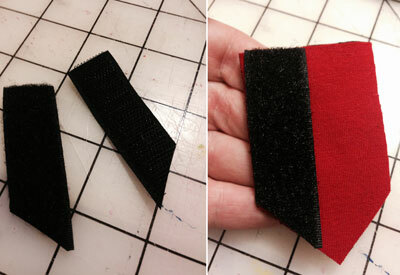 My black strips were cut 3 inches tall and a little wider that the width of the sleeve. I folded under the edges about a quarter inch and top-stitched them in place. Then it was time for the colorful stuff! 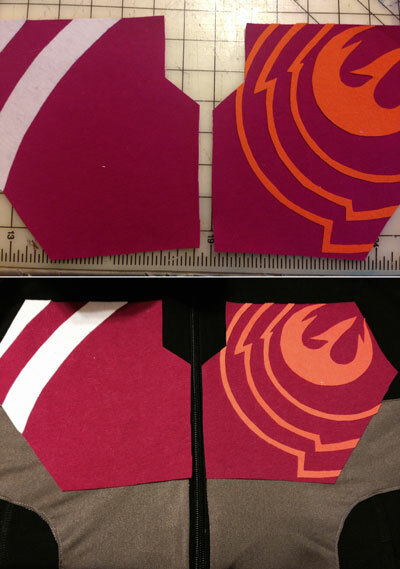 I made templates for the pieces that would mimic Sabine’s Mandalorian armor. I used 1-inch gridded pattern paper here to give you an idea of the sizes on my shapes, but you will likely need to adjust for your proportions. This is one of those trial-and-error kind of things — I find that my first round of pattern templates usually needs a good bit of tweaking, so I just trim and adjust until I’m happy with it. 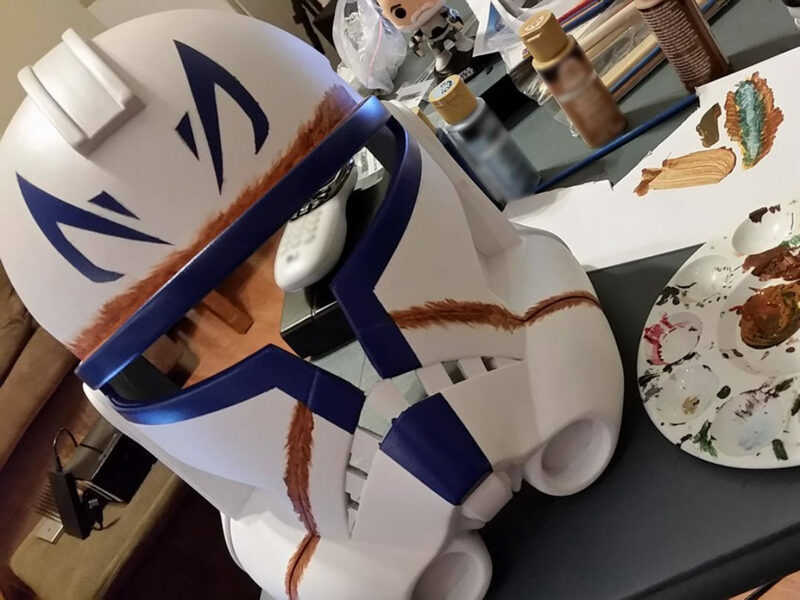 For everything other than the checkerboard pauldron (including detailing), I used remnants that were cotton/spandex blend. 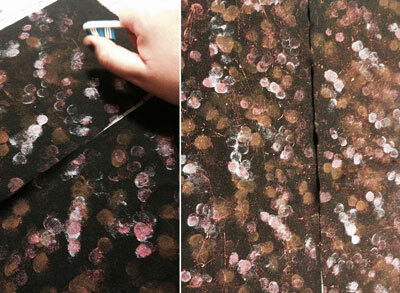 Word to the wise: Test all of your fabrics with the iron. Nothing kills the fun of a project more than a melted fabric, and spandex can sometimes be tricky. You can always dial back the heat if you need to – these pieces all get stitching around the edges, so your faux armor doesn’t have to be super fused to the jacket. They just need to be held in place long enough to sew around all the edges. I used the exact same process for my detail pieces as I did for the larger armor elements, patterning them out on scratch paper, then drawing them onto the paper side of the Heat-n-Bond, cutting them out and then fusing them to the correlated armor pieces. For the pieces of faux armor that required additional detail elements, I waited to peel their paper backing until everything was in place, then fused the completed, detailed piece to the jacket. The breastplate pieces have a lot of details. The curved stripes on the left piece are fairly easy to cut. 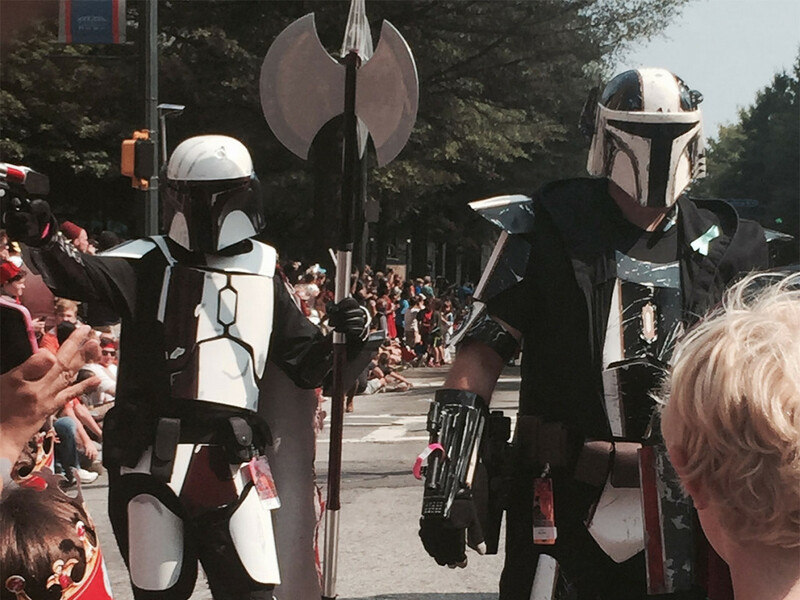 The starbird and jagged, curved stripes on the right side are a little trickier. I just made copies of the breastplate pattern on sketch paper and kept drawing the details until I got them to a point I liked, then I used those to trace onto the Heat-n-Bond. Note: When you draw on the paper side of Heat-n-Bond, you’re essentially drawing on the back side of your fabric, so reverse the designs! 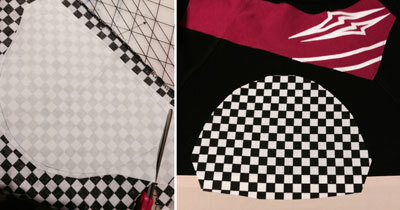 To create the anooba design for the orange pauldron, I first roughed it out onto the fabric with a pen. (I practiced on paper a few times first.) Then, I painted the inside of the design with a pink paint. One of the things I love about Sabine’s armor is that the art on it isn’t perfect. It feels organic and spontaneous, so this image doesn’t have to look perfect, either. I daubed some silver paint in a few areas for highlights, as well. 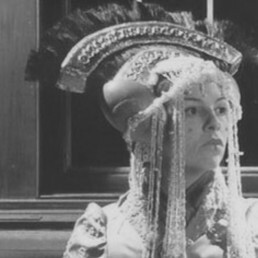 Once the orange shoulder pauldron was fused to the jacket, I went over all my sketch lines at the sewing machine with a very tight zig-zag stitch — this is often called a satin stitch, and requires an extremely short stitch length. Your sewing machine may even have a satin stitch setting. This is one of those things that you get better and better at with practice, so do some test runs! To fill in the eye section, I used a wider zig-zag stitch and made two rows, but overlapped them as I tapered into the narrow end. 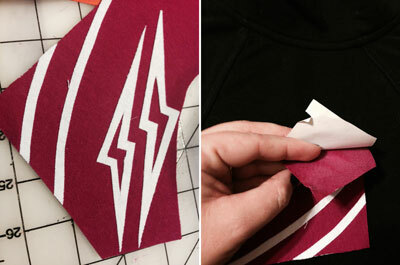 The elbow guards were traced onto the paper backing of the Heat-n-Bond, ironed onto the magenta fabric, and then fused into place. The key here is to remember to place them towards the side of the sleeve that will sit at the back of your arm. Sabine’s gloves have awesome, paint-spattered gauntlets that I wanted to copycat on my jacket. 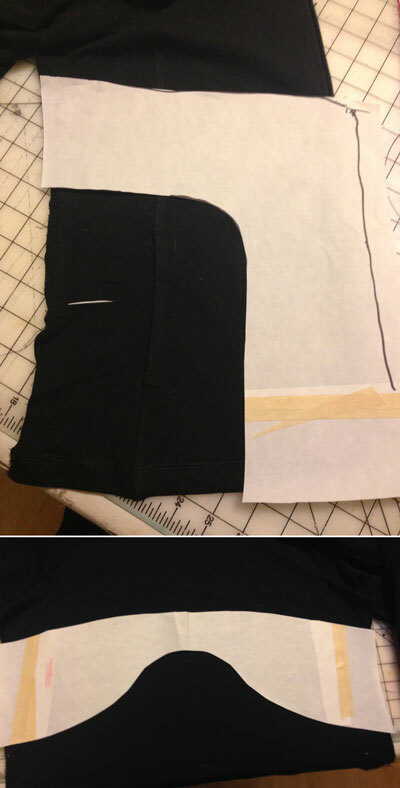 I cut two strips of black cotton/spandex blend fabric a little wider than my sleeves and 6 inches tall. (you may need more than that — it has to reach from the cuff seam up far enough to cover the raw edge of the skin-tone spandex). Then, I smeared purple, orange, and magenta paint onto the fabric with my fingertips. I also applied paint to an old tooth brush and swept along the bristles to create smaller spatters. This step is super fun (but messy)! Once my paint had dried thoroughly, I folded over one edge of the fabric and hemmed it. I flipped the piece face down with the unhemmed edge of the fabric aligned with the cuff seam and sewed it into place, then flipped it right side up and stitched the hemmed edge down so it covered the bottom of my skin-tone fabric. As in previous steps, I basted the fabric along the sleeve edge and cut off the excess. 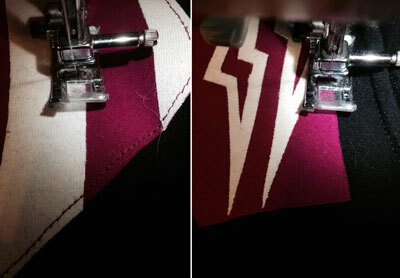 This next step takes a little time and patience, but it’s nothing you can’t handle if you’ve done a little stitching. I stitched around every edge of all of my ironed-on pieces, about a sixteenth of an inch from the raw edge. 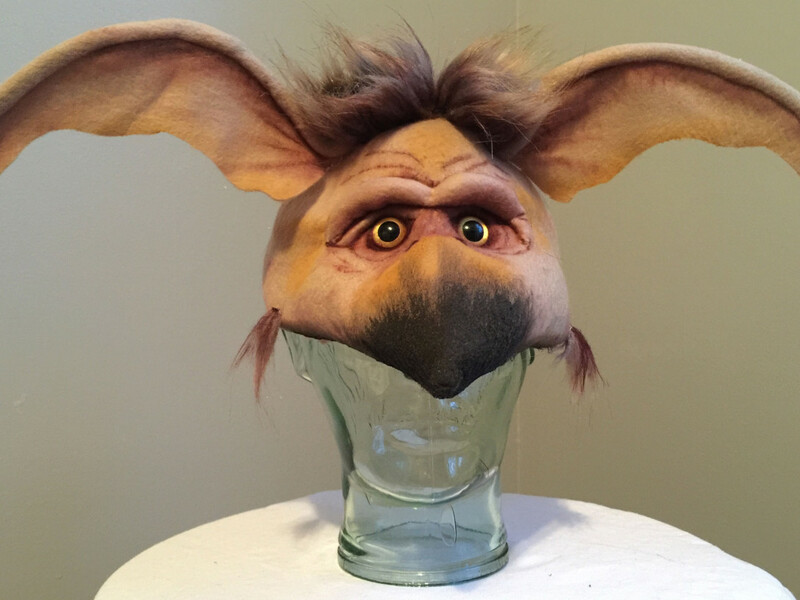 This includes all exterior edges of the faux armor, as well as all the detail pieces. Working around the narrow striping can get a bit tedious, but this step ensures that your detail work stays put through washing and wearing. Once all of your armor pieces have been stitched into place, it’s (finally!) time to close up your side seams again. 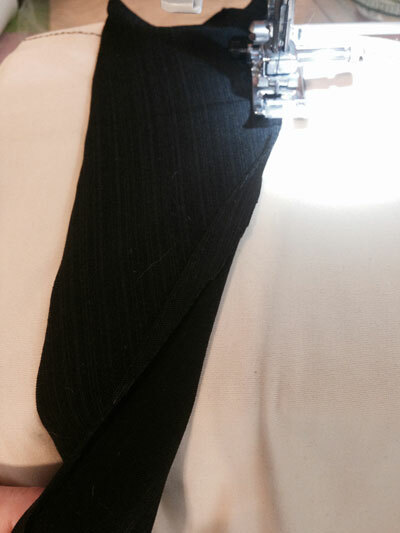 Stitch carefully, matching the original seam allowance of the jacket as closely as possible. On most garments, this will be about a quarter of an inch. This is when marking all the positions of your various pieces pays off — your silver details and sleeve color blocking should match up pretty closely. 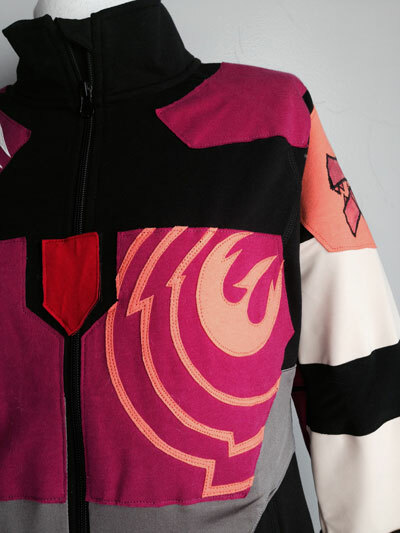 Because the small red piece that sits in the center of Sabine’s chest armor straddled the zipper on my jacket, I wanted to make sure it could close on its own like a little tab. I first used the Heat-n-Bond to fuse two pieces of red fabric to a backing fabric — this is to give this piece a little extra stability. 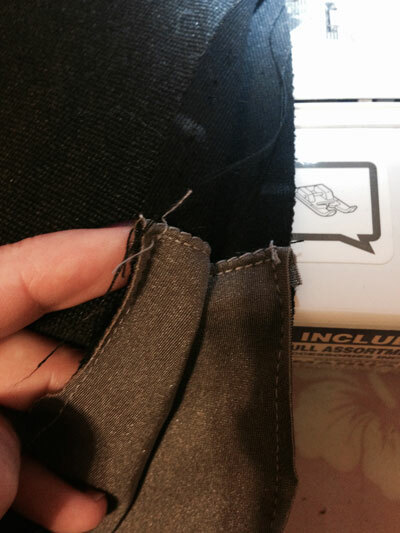 I cut two corresponding pieces of Velcro to match the size and slant of one side of the tab. Then I stitched the loop side of the Velcro (this is the softer side) to the back piece of the tab. Once the Velcro was sewn on, I placed the two pieces of the tab wrong sides together and stitched all the way around the edges to join them. With the zipper closed, I centered the tab piece and pinned it in place. Then I unzipped the jacket and stitched the tab in place along the side without the Velcro. I zipped the jacket back up to determine the placement of the loop side of the Velcro (the harder side) and then stitched it into place. Note: Making sure the loop side faces outward means you won’t snag or damage any of your shirts when you’re wearing your jacket open. Once the tab and Velcro were in place, my new jacket was all done. I’m ready to go start a very colorful rebellion! Holly Frey co-hosts the PopStuff podcast at HowStuffWorks.com. 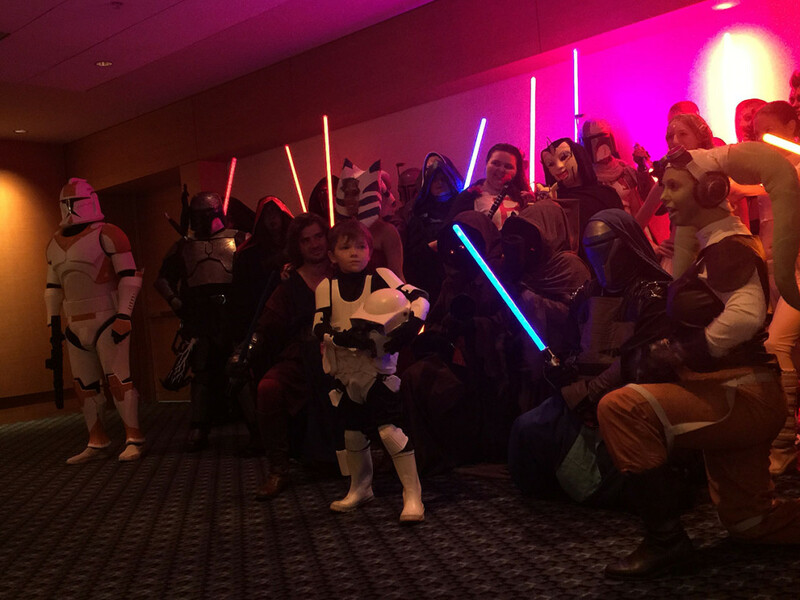 She’s an avid costumer, and Star Wars has been an integral part of her life since opening day in 1977.